• House Speaker Feliciano Belmonte, Jr.
ক. ^a The 1987 Philippine constitution specifies, "Spanish and Arabic shall be promoted on a voluntary and optional basis." খ. 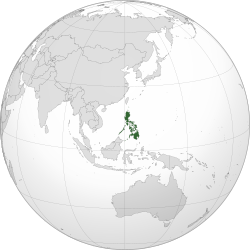 ^b Philippine revolutionaries declared independence from Spain on June 12, 1898, but the Spanish claim of sovereignty was passed from Spain to the United States in the Treaty of Paris. This led to the Philippine–American War. ↑ "Republic Act No. 8491"। Republic of the Philippines। ২০০৭-১২-০৫ তারিখে মূল থেকে আর্কাইভ করা। সংগ্রহের তারিখ ২০০৮-০৯-৩০। revisited on November 19, 2010. ↑ General Information. (older version – as it existed in 2007 – during the presidency of Gloria Macapagal Arroyo), The Official Government Portal of the Republic of the Philippines.